During the past five years in Florida, health officials saw an average of six mumps cases annually. However, this year the the Florida Department of Health (FDOH) has seen 56 cases through mid-December. While cases have been reported statewide, certain counties accounted for the bulk of cases– Broward, Collier, Duval, Hillsborough, and Palm Beach. This significant increase has prompted FDOH officials to issue an advisory for health care providers for guidance on sample collection and lab testing and vaccine requirements. Mumps cases have occurred across all ages (median 25 years, range 0-83 years). College students tend to be most at risk due to living in close proximity to other students. Immunization verification of incoming freshmen prior to attending college has proven to be the most effective way to minimize outbeak risks. Preliminary data indicate that among the cases, 50 percent have documented history of MMR vaccination (typically remote). Small mumps outbreaks have been investigated among household and other close contacts, and among a group of high-school students and their contacts. CDC recommends children get two doses of MMR vaccine, starting with the first dose at 12 through 15 months of age, and the second dose at 4 through 6 years of age. Teens and adults should also be up to date on their MMR vaccination. 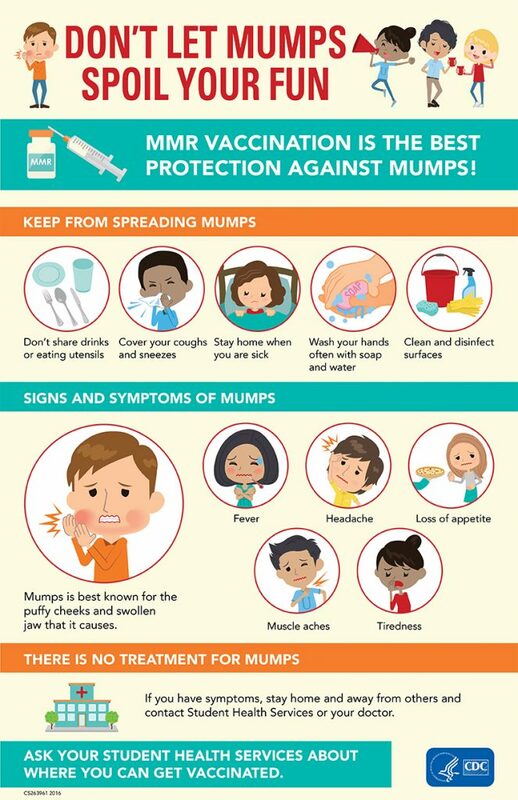 In October, the Advisory Committee on Immunization Practices recommended a third dose of mumps-containing vaccine for persons who are identified by health department staff as at increased risk for mumps during an outbreak to reduce the risk of infection and complications. The Florida Department of Health will notify health care providers if outbreaks occur that would indicate a third dose of mumps-containing vaccine for specific at-risk persons or groups. Before the U.S. mumps vaccination program started in 1967, about 186,000 cases were reported each year, but the actual number of cases was likely much higher due to underreporting. Since the pre-vaccine era, there has been a more than 99% decrease in mumps cases in the United States. Since the two-dose vaccination program was introduced in 1989, mumps cases have ranged year to year from a couple of hundred to several thousand., However, in recent years, there has been an increase in the number of reported cases, from 229 cases in 2012 to 5,833 cases in 2016. The recent increase has been mainly due to multiple mumps outbreaks reported across the country in settings where people often have close contact with one another, like college campuses. From January 1 to December 2, 2017, 48 states and the District of Columbia in the U.S. reported mumps infections in 4,980 people to CDC.